Cheap meals and plenty of large flat screen TV's - if you are looking for anything else then you would do best to avoid. Yes, this place does not improve. Guess they don't think they need to, there always seem to be plenty of punters in there, Lord knows why. (The only thing I can say about it is that afaik this is the only pub open before midday in Mumbles). 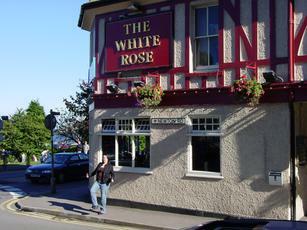 Such a shame that The White Rose has deteriorated to such an extent that many locals and past regulars won`t go there anymore. Stinking toilets that don`t seem to get checked, dirty and grubby bar areas and a patio with overflowing ashtrays and tables that are never wiped clean and caked with bird droppings. Majority of the staff are surly and seem to think they are doing you a favour by serving you, they seem more interested in texting on their phones and huddling in a corner chatting to avoid the customers, never seen a pub run like it! Total lack of management, needs a total overhaul. Was going to have food. Lucky went to the toilet before ordering..
my husband and i went to the white rose a while ago and the food was awful. we had breakfast and it was very greasy and the service of the bar staff was rubbish. we returned there a while later and the food was much better as they had employed a new chef, but the bar staff were not brilliant. service was rubbish. wont be going there again!